Who doesn’t love a bowl of rice pudding? It’s like the ultimate comfort food in winter! And it is one of those dishes you can find in so many different cultures! In Denmark in the winter months and especially around Christmas, you will find Risalmande: a rich dessert made with cream, vanilla and almonds (chopped and just one whole), topped by a luscious cherry sauce. If you are lucky enough to find the whole almond, you will get a present and will have a prosperous year ahead! The German version is called Milchreis: rice cooked in milk with cinnamon and sugar and topped with apple sauce or rote Grütze, a sweet fruity sauce made with red fruits and berries. Arroz con leche is found in many South American countries, everyone has a different recipe, but basically, all contain milk, sugar, cinnamon, raisins and other spices and flavours like lime, orange, nutmeg, cloves and so on. It might be made with condensed milk, making it sweeter and creamier. And of course, there is rice pudding in Asia as well! No wonder, being rice such an important component in the everyday diet here! You can check out my simplified recipe for Thai Mango Sticky Rice, it’s delicious even if it is not traditional rice pudding and an amazing dessert. Today I want to share with you Kheer, the Indian version of rice pudding. I found tons of recipes and it is probably just like with many popular home dishes, that every family will have it’s own. Kheer is creamy thanks to the coconut milk (not cream! 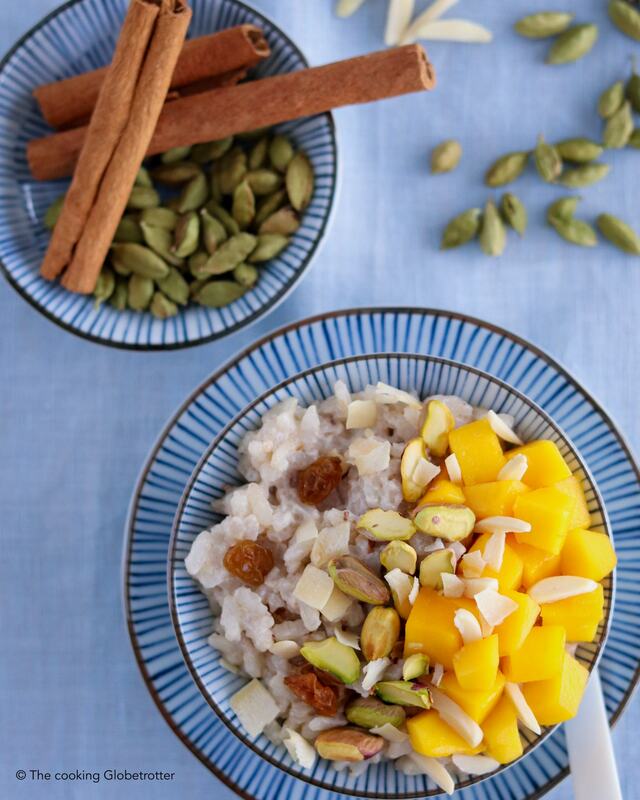 ), warming because of the spices cardamom and cinnamon, lightly sweetened by the dates and golden raisins, pistachios and almonds make it crunchy and the mango just makes it fresh and more delicious! An amazing combination and explosion of flavours with every spoon you take! 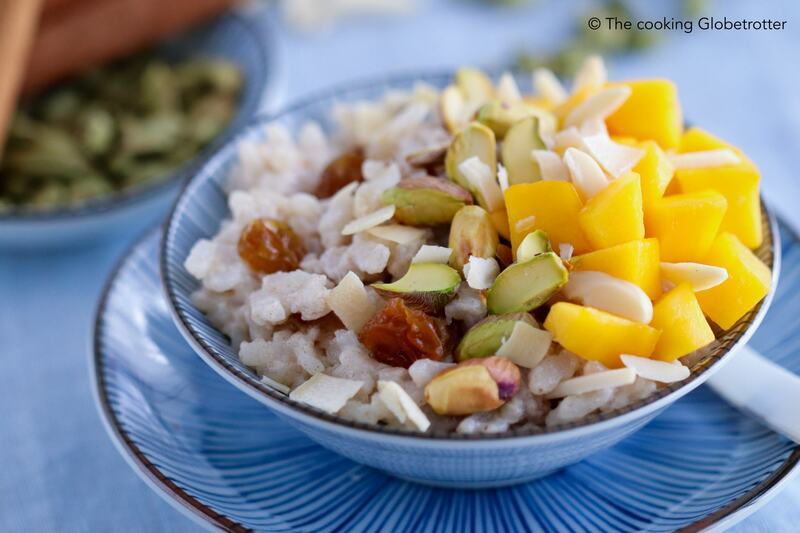 Have you ever had an Indian rice pudding? No?! Well, then you need to try one! Let me tell you how to make it! My version is dairy free and refined-sugar free and serves well two to three persons, it takes about 30 minutes to prepare and cook. Put rice (100g), milk (coconut 500ml), the piece of cinnamon and the smashed cardamom in a small pot and turn on the heat. Once it starts simmering, lower the heat down and stir frequently. You will need to keep a close eye on it and stir. After 15 minutes of cooking, add the chopped date and the raisins. This is going to give it natural sweetness (so you can use also sugar or syrup if you prefer). When the rice has soaked up the milk it is done. Turn off the heat and let it rest a couple of minutes. You may enjoy the rice pudding warm or cold (I love to eat up the leftovers, if there are any, for breakfast with fresh fruits!). Pour it in a nice bowl, add some pistachios, sliced almonds and mango (or any other fruit you like) and top it with coconut chips or flakes. What is your favourite rice pudding? I’d love to know in the comments! *affiliate link: this post contains affiliate links, meaning I recommend products I’ve used and may receive a commision if you purchase them too (at no additional cost to you). Milchreis mag ich am liebsten mit Zucker und Zimt. Aber diese Variante klingt auch toll. Hier ist auch Zimt drinnen und Datteln und Rosinen statt Zucker, könnte also auch was für dich sein, Bente! Vielen lieben Dank! Schmeckt phantastisch mit all den Gewürzen! Oh ja ein Traum mit heißen Kirschen, Paula! Das ist auch so gut, Sandra! Ich mag meinen Milchreis, ganz klassisch, mit Zucker und Zimt und gerne noch einen Schuss Zitrone, am liebsten. Das klingt sehr gut! Mit Zitrone so erfrischend! Das ist eine wunderbare Kombination! Danke Katja! Das freut mich sehr! Ja Milchreis ist einfach wärmend und gemütlich irgendwie! Danke Diana! Das freut mich sehr zu hören! Ich finde sie schmecken total waermend und erfrischend zugleich! Das klingt sehr lecker Franziska!